“Marat, Membre de la Convention”, 1882, after a painting of the same name executed in 1793 by his father, Jacques-Louis David (1748–1825). I am selling this delicately executed print for the total cost of AU$65 (currently US$48.75/EUR43.93/GBP36.97 at the time of posting this print) including postage and handling to anywhere in the world. 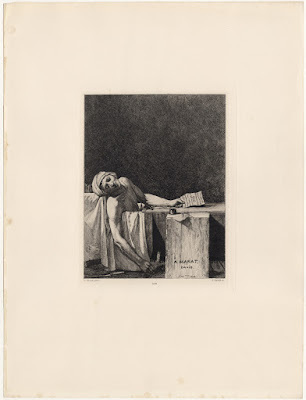 This is the second etching that I have posted recently by Charles-Louis Jules David (the son of the grand Neo-Classical painter, Jacques-Louis David). 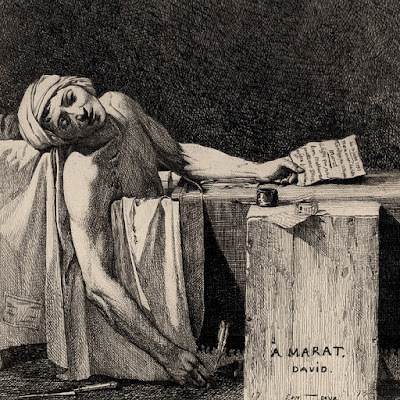 I suspect that all folk would know this image very well as it has risen to fame as an icon of French culture even if Marat himself may not be a cherished figure by everyone. Sometimes a reproductive etching of a painting executed solely in black line is more than a mimetic representation. 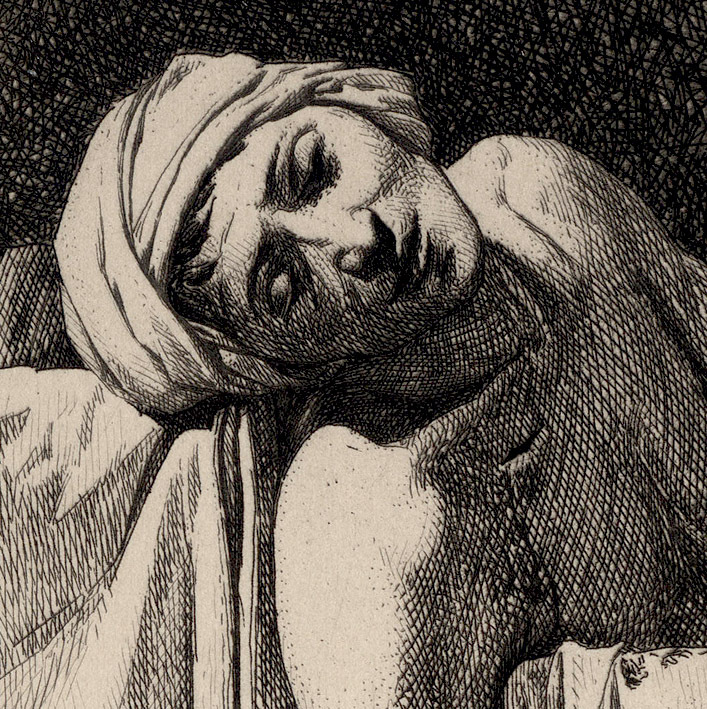 This is certainly the case with this small masterly print. 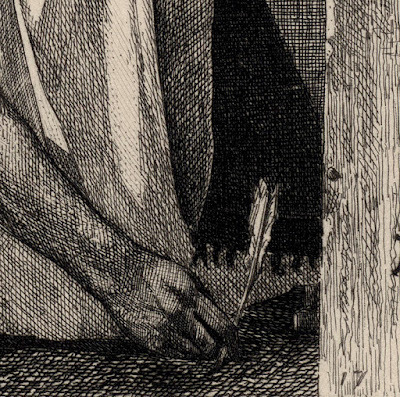 Like the work of a master, the use of line replicates more than the tones of the painting. 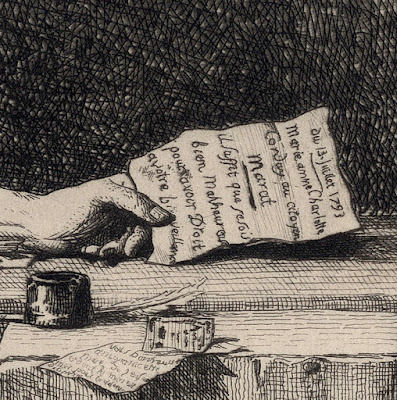 From my way of looking at the etching, the black lines also suggest passages of translucency and opacity of the painting’s colour. For example, the curved crosshatched lines describing the contours of Marat’s flesh capture the luminosity of the transparency of the glazed colours of the painting in this area in contrast to the straight lines of crosshatching rendering the opaque depth of the background colours. 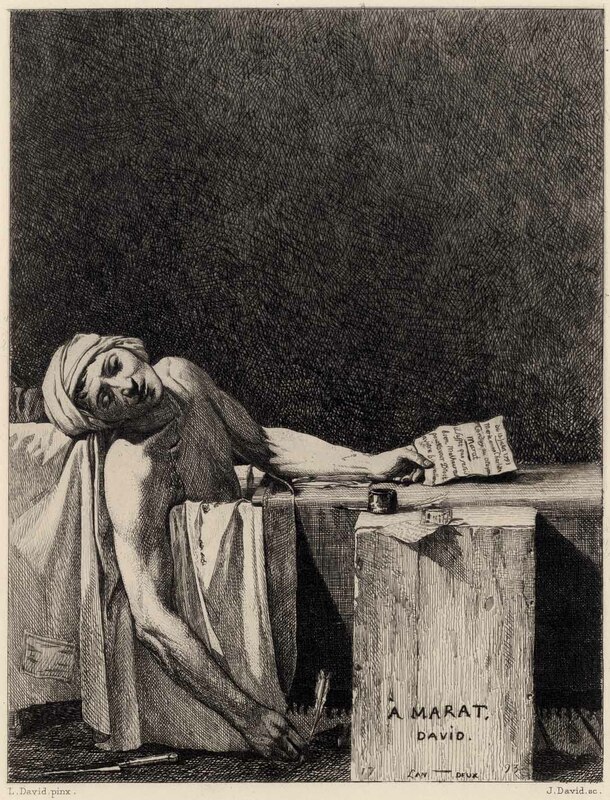 If I may go a little further with this proposal, the mixture of loosely hatched strokes laid over a field of vertical lines describing the textures of the crude table on which the bottle of ink rests projects a solid opaque surface that is very different to the attributes of Marat’s flesh and the far distance. In terms of black lines representing colours, this notion is not as vague as one might imagine. The code of heraldic representation of colours (e.g. blue is horizontal, red is vertical and black is a combination of horizontal lines over vertical lines … amongst the other colours signified by heraldic code) is still used in electrical engineering—so I am told. Consequentially, at a subliminal level, the arrangement of the different hatched strokes suggest colours. In this reading of the print, the hatched strokes of the background express black, the angled strokes rendering Marat’s body express the heraldic colours of green and purple, and the mixture of strokes rendering the table express a yellow-red.